The King, and yes, there is only one, would have turned 74 today had he been able to find enough peace and contentment in his extraordinary life without gobbling pills and banana-peanut butter-and-bacon sandwiches. Instead, he died at age 42, over-weight and strung out. I wonder what Elvis would look like now. Would he be still have those incomparable pipes, the sneer, the southern boy manners? Maybe touring with Mick and the Stones? More importantly, what does this have to do with Mexico? Think back to 1963, or ask your parents to. Elvis was pumping out a series of B movies, and that year it was Fun In Acapulco. He played Mike, who is fired from a fishing boat and gets a job as lifeguard at a tourist hotel, where he meets the fetching Ursula Andrews. 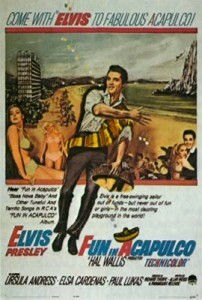 Word is that he never actually went to Acapulco, filming all of the scenes in a Hollywood studio, but the movie did introduce the town to a world-wide audience. Before Cancun, Cabo and Puerto Vallarta there was Acapulco, the grand dame of Mexico tourist towns. Give it a try next time, you’ll find the prettiest bay in Mexico. Previous PostLoreto, Baja California Sur: Twice as Nice at Half the Price! Loreto Guests Receive Every Other Travel Purchase for Free – GOOD THRU JAN 31, 2009! !Next PostGo Green for Less Green at Baja’s First Green Globe Certified Resort!